We are quanta. We are each individuals and as such we feel separate from that which surrounds us. However the billions of us on the Planet are engaged in an ongoing quantum calculation. It is waves of our human actions that impact the Planet, solving for survival. A quantum computer has the ability to calculate multiple possibilities simultaneously. For example, to solve a password problem a conventional computer would try all of the possible solutions, one at a time. A quantum computer would try all possible options at once, filtering out the failures and finally settling on one that would be implemented, while the others would act as if they were never even tried. Seems to me that this is a pretty good description of how our mind works. We consider many options, evaluating them against each other in a virtual space where the actions are simulated. We finally settle on a plan of action and do it. The rejected options act as if they were never tried. So, each agent in our system is like a quantum bit. Each one is a multifunction unit that contains its own processor, operating system, input/output devices, memory and power supply. The problem we are solving is how to grow, reproduce and disperse among the other quantum bits that form our Universe. The only way this could work is if the system “knows” what each bit is doing in real time. The system has to be aware of the progress of all of the options being calculated at once. This is the coherent, holographic, quantum field property of the physical Universe. This is very similar to the idea of multiple universes, except they all exist in a quantum virtual reality, while only one solution is manifest. A quantum calculation processes all possible outcomes at once, assessing probabilities, filtering and sorting, until a solution is reached. Once implemented, the solution becomes input for the next wave of calculations. The system is always trying to predict and validate its future. It does so in waves of repeating cycles. This happens in our version of consciousness. We humans are constantly predicting our immediate future. We are constantly calculating velocities and trajectories of moving objects around us, while we keep track of our own location and movement. Will that truck arrive before i can cross the street, or not? Other mobile agents in our system are doing the same thing. Neurons are quite capable of acting the same way. They are constantly predicting what their input should be and react when it is not as expected. This pattern of process repeats throughout Natural Systems. Human beings are agents within the system and act like quantum bits. We are a great example of quantum computation. Take a task force attempting to solve a problem. Each member takes on the solution as a goal. Each member embarks on a search limited by what they see as the best possible solution. All members are in contact and share their ideas. They each choose the possible solution based on their perspective, while being aware of the progress of other possibilities. When a consensus is reached, action follows a single path and the many other possibilities vanish as if they were never considered. In this model, the quantum process is consciousness in action. Just as we share ideas and reach conclusions, so do our neurons. So do the lactose intolerant cells of e.coli when confronted with only lactose for food. So do stem cells. And so does water, coherent electromagnetic fields, and plasma. 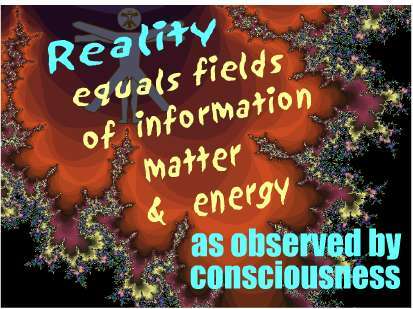 All is quantum consciousness, with ours being a subset. Just as our subset produces a single point of consciousness from trillions of cells, so does every other subset up an down the scale. On the one end we have single cells endowed with a sense of self, while species, ecosystems and Gaia herself show the same ability. What do stem cells, superbugs, dopamine neurons have in common? The common thread is that these cells change their structure in response to incoming information. They adapt to changes in the environment. It doesn’t require generations for natural selection to bring about adaptive change, cells adapt to the environment in real time. Natural selection tests the validity of the adaptive changes, but they originate at the cellular level. In other words, direction, purpose and goal oriented behavior are present and active at the cellular level. This system isn’t guided by blind chance, but specific targeted goals, like growth, reproduction and dispersal.